The geographic location of the Kingdom of Naples had always fostered the development of naval forces, both merchant and military. We here overlook the Roman age (which was nevertheless marked by the flourishing of important maritime cities). In early Middle Ages we have clear examples such as that of Cesarius Consul galleys that in AD 849 saved Rome from the Saracen invasion in the battle of Ostia; and then the flourishing of Amalfi, where the compass was invented and the “bora” wind was called “tramontana” since it arrived in Amalfi blowing from the direction of the town of Tramonti. 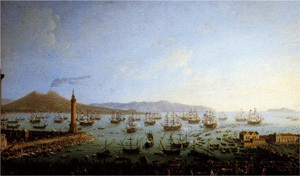 During more modern times, the 38 armed galleys present in Naples and Sicily under the Spanish flag in the battle of Lepanto and representing the second greatest contribution – after Venice – to the fleet of the Christian League. When Charles of Bourbon became King of Naples and Sicily in 1734 and established the Bourbon Dynasty, restoring the independence of the Kingdom, there was a different situation due to the continuous raids of Barbaresque pirates who threatened coastal areas and trade. In April 1738, a squad of Algerian xebecs entered the Gulf of Naples with the clear and declared intention of kidnapping the King and taking him as hostage to the Turkish Bey of Algiers. This foolish plan failed, but Charles saw in it a clear sign of the need for a serious strengthening of his military naval forces to make them up to the role of Mediterranean power. From this moment on the Bourbon of Naples started their policy of reforms – which has always been their mark – also in the naval sector and they made the Neapolitan navy so modern and powerful that only the navies of very few other important countries could bear comparison. Charles created a naval defence system by deploying three naval squads in crucial points of the kingdom. The first controlled the Thyrrenian coasts, the second the Ionian coasts, the third Sicily. To make the lives of his subjects safe, Charles did not overlook diplomatic treaties with the Sultan of Constantinople, who also held the regencies of Tripoli, Tunis and Algiers. Although the raids continued as before. At this point Charles started to react with his forces and the raids began to diminish and in the end almost ceased at all. When he left to be crowned King of Spain in 1759, Charles of Bourbon appointed a Regency Council for Ferdinand IV, who was then aged 8. The Council overlooked the naval policy, but Ferdinand, once taken over full powers, didn’t. He immediately understood the need for strengthening the Naval Fleet, to protect both his subjects and maritime commerce. In this policy, he was helped by the British Prime Minister John Acton who lately became also Minister of the War and the Navy due to his extraordinary competence as seaman. Together, they prepared an ambitious plan to develop yard and naval construction. In a short time, 6 vessels with 74 cannons and 6 frigates with 32/40 cannons were built. A new and more efficient naval dockyard – besides the one already existing in Naples – was built in Castellammare di Stabia, in an area located between the woods of Monte Faito and the mineral spa. It was one of the first naval dockyards in the Mediterranean, also by size, and was equipped with three impressive yards to work simultaneously on three large vessels. An impressive machinery with ten winches – on each of which 36 men worked – and considered a real wonder for that time, allowed to easily beach ships of all sizes. Arturo Faraone wrote: «It was a real “Model dockyard” for those times: the new industrial techniques of the industrial revolution were applied in it and highly qualified local workers were trained, which were famous as excellent naval constructors. Under the Bourbon dynasty, the Castellammare Dockyard launched very modern and fastest naval units for those times, such as the frigates Partenope, Ercole, Archimede, Charles III, Sannita and Ettore Fieramosca, equipped with 300 HP machines. In the twenty years elapsing from 1840 to 1860, from the launch of the Generoso Brigantine to the launch of the Bourbon Frigate, more than 43,000 tons of ships – vessels, frigates, gunboats and brigantines – were launched. The Castellammare Dockyard continued its glorious activity also after the unification of Italy. The two school vessels of the Italian Military Navy – Cristoforo Colombo and Amerigo Vespucci – were launched from its yards in 1928 and 1931 respectively. As evidence of the value obtained by the fleet also at international level, in 1784 the Neapolitan fleet took part in a joint action against the Barbaresque fortifications of Algiers together with the Spanish, Maltese and Portuguese fleets. 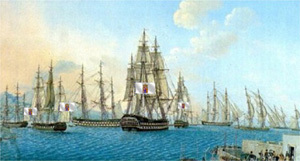 It stood up in the siege of Toulon in 1793: Ferdinand gave the First Anti-French Coalition three vessels (Guiscardo, Sannita and Tancredi, the latter commanded by Francesco Caracciolo), four frigates (Aretusa, Minerva, Sibilla and Sirena), two brigantines, and a contingent of 6,500 men equipped with the new 1788 guns. They stood up in the three months of the siege and were admired even by Napoleon. We related the tragic and glorious events that occurred in 1799 (see the headings: “Ferdinand IV ” and “Pro-Bourbon Uprising”), which saw in a six-month span, war against the Napoleonic army, the loss of the Kingdom by Ferdinand (and the set up of the short-lived Neapolitan Republic), and its reconquest by the insurgents led by Cardinal Ruffo. During these overwhelming events, Ferdinand was convinced by Horace Nelson (an Englishman present at Court besides Acton), who was in Naples as “protector and friend”, to set fire to the entire fleet in Naples and Castellammare so that it could not be taken by the Napoleonic invaders who were about to enter the capital. On 9 January 1799 the broken-heart and devastated Neapolitans witnessed this tragic show and could never forget it. In the gulf, the entire fleet was suddenly in flames under their eyes. The destruction of the fleet of the Kingdom of Naples was an enormous benefit for the British rule over the Mediterranean and a further push of the Kingdom in the hands of the British. Ferdinand had to escape to Sicily and remain there from 1806 to 1815, and only in 1815 could he go back to Naples and take over the real rule of the Kingdom, now called of the Two Sicilies. He immediately began to reorganise his armed forces (the experience of the last twenty years had left its mark), and in particular the Navy. The first steamer of the Mediterranean was launched on 24 June 1818. The “General Decrees of the Royal Navy” were issued to organise the Naval Fleet, including the general provisions on uniforms. In only four years, the Navy was able to deploy three divisions with 70 warships of all sizes. The military maritime policy was continued by Ferdinand II. The Neapolitan fleet was equipped with steamboats, at first with paddles and later with propellers and became one of the most powerful in the Mediterranean. In 1834 the “Royal Military Mechanical Factory” and the first “School for Mechanical Engineers” in Italy were established at Pietrarsa, and the latter was completed by a factory that manufactured tools and naval machines for the Neapolitan steam frigates. Navy after 1861. In the harbour of Naples Ferdinand II also built the first repair dock in Italy. The Naval Fleet had increased its number of frigates and steam frigates with paddles and 50 cannons, several brigantines and steam corvettes. 6- Administrative Corps with three Departments (Naples, Palermo and Messina). The supreme body of the Naval Fleet was the Admiralty, ruled by a prince of Bourbon, the King’s brother, Commanding Officer of the Naval Fleet with the rank of Vice-Admiral, helped by an Admiralty Council. The Fleet was also summoned to operate overseas, in Brazil. Its officers were trained at the Royal Naval Academy established in 1735, that had one of the most beautiful astronomical and naval observatories in Europe. In 1841, Ferdinand II united it with the Nunziatella Military Academy, so that the naval officers-to-be could be selected among the students of the military college. In 1848, during the First War of Independence, Ferdinand II sent 5 steam frigates and 2 sailing frigates, 1 brigantine and other means of transport with 4,000 soldiers under the lead of Guglielmo Pepe to free Venice from the Austrians. The revolt of 15 May brought it to nothing, and the King withdrew from the war. 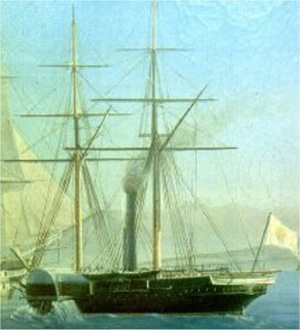 It is an unquestionable fact that the Italian Navy originated from the progressive aggregation – in 1860/1861 – of pre-unification Navies (Sardinian, Neapolitan and Tuscan) with the addition of the Garibaldian Navy and two papal units, booty of war, found in the harbour of Ancona. When the Kingdom was proclaimed, the fleet was formed by 97 ships, 79 of which operative; of the latter, 22 had a propeller, 35 had paddles and 22 were sailing ships; they came: 32 from the Sardinian Navy, 8 from the Tuscan Navy, 2 from the Papal Navy and 37 from the Navy of the Two Sicilies (24 from the Neapolitan and 13 from the Sicilian Navy).